Today, it’s the CAS challenge using Plum, Lavender, Tan and Gray and the TLC challenge over at Splitcoast using embossed edges. Now you might ask where’s the plum, lavender and gray on this? Well if you look really closely at my trees they’ve been stamped and inked in all these colors. I started out with a piece of plain white card stock and inked one of my Tim Holtz Mixed Media stamps with Shaded Lilac and Dusty Concord. Next I spritzed my stamp before placing it on my card stock. Once that was done, I inked my craft mat with Antique Linen and Weathered Wood, spritzed it with more water and pulled my paper through that. Then, the trees were cut out with the Dee’s Distinctively Snow Covered Stacker Tree die. Next, I took my Versamark pen and inked the edges of each piece of each tree and embossed them with Distress Embossing Powder. If you haven’t worked with the Distressed Embossing Powder…it’s a little different. Once you’ve used your heat gun to heat the embossing powder, you let it cool and then brush off some of the release crystals….it makes for a very understated look but I love it! I glued my trees to the background with glue dots and used my fingers to lift the branches to add depth. 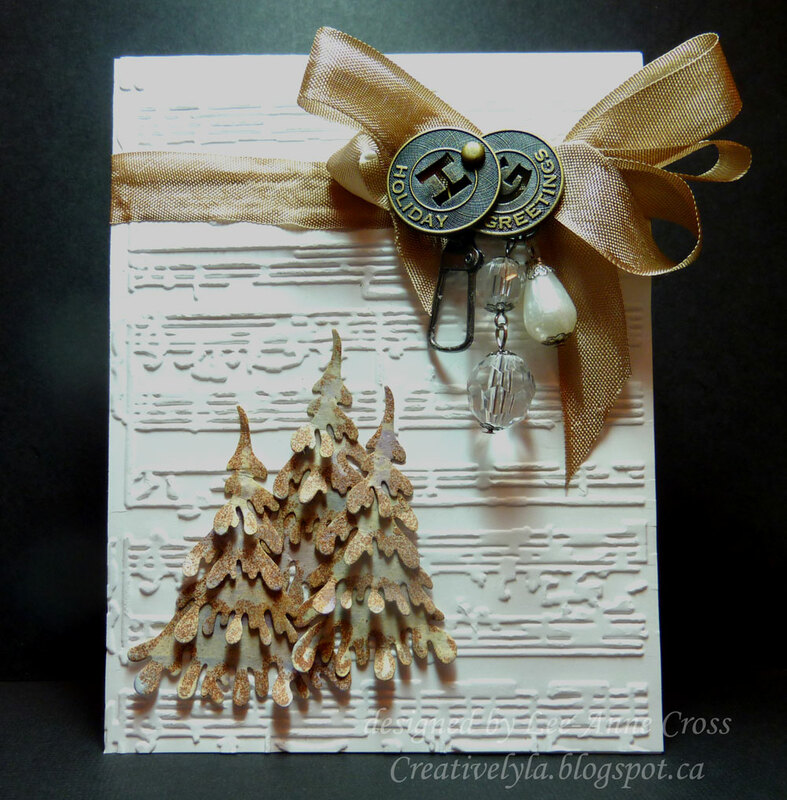 My background is dry embossed with a Tim Holtz embossing folder. Then I tied a piece of my seam binding around the card stock, added a bow and then all my embellies. Yes, there are a few on this but I like it! Those trees look fantastic on the music embossed background! The embellies in the corner are so creative a fun! Love this Lee-Anne! Loving all the texture on this card and your covert ops on the use of the colours on that fabulous tree is very well done wink, wink. Wonderful embossed BG too! This is beautiful! Love the background and all the embellies!